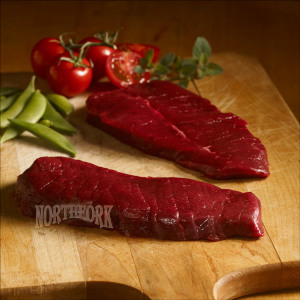 Ostrich Meat – Savoury and Delicious! 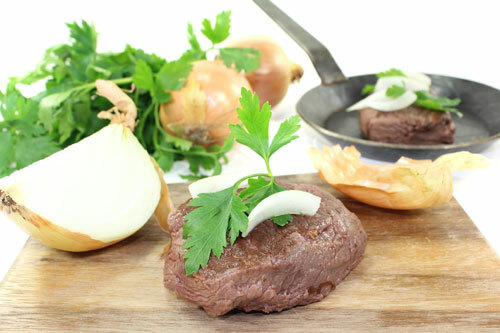 With it’s combination of great taste and nutrition, and its incredible ease and versatility in cooking, ostrich meat has rapidly found its’ way onto the menu of many of the finest restaurants in the world. Chefs like its’ amazing fresh meaty taste and are finding many exciting ways to prepare and present ostrich. 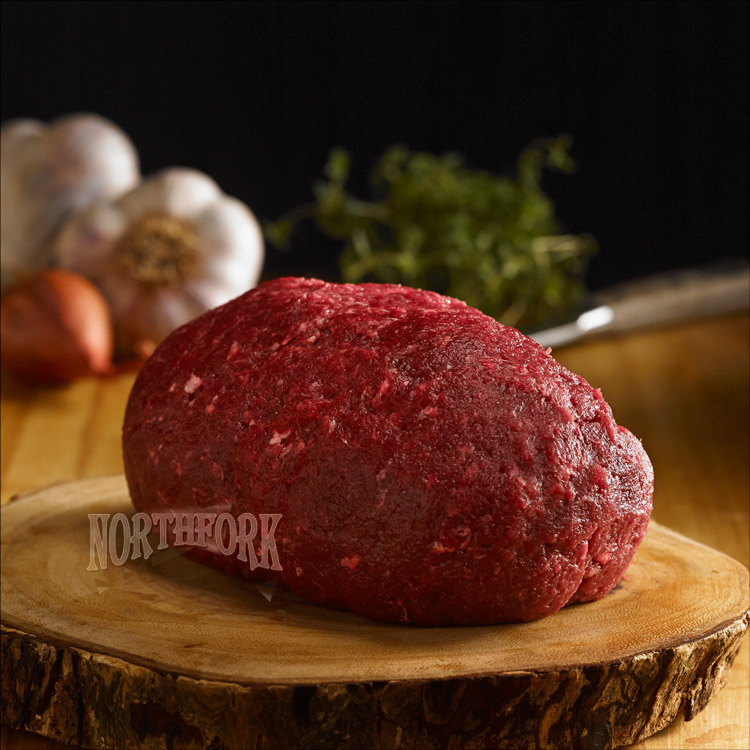 The ostrich meat you buy from Northfork is all natural. We do not use any hormones, antibiotics or chemicals and additive in our ostrich cuts. Visit our online store for more info. Buy Canadian ostrich steaks and burgers online. If you’ve never tried ostrich meat, you’re missing a treat! Ostrich is like premium beef in taste and texture. It grills like any lean steak, and because it is so lean you will not see any shrinkage during cooking and have more meat to enjoy! 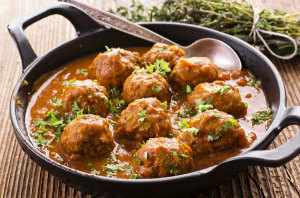 Ostrich meat is iron rich, and it is a great way to reduce your fat and cholesterol intake – while still giving you an awesome, savoury, meaty meal. When it comes to the combination of great taste and healthy eating, ostrich is truly one of the most superior meats. It’s even lower in fat than white meat chicken or turkey. If you are wondering where to buy ostrich burgers or steaks, just click to visit our online store. Ostrich Steaks – Red meat from a bird? Ostrich meat doesn’t taste like “other birds” because it is not a bird at all. It’s meat is red like venison and the taste is similar to prime beef. Other’s say it tastes like veal. You have to try it for yourself and come to your own conclusions. We would like to hear what you have to say about the taste of ostrich. The meat comes in all of the cuts that beef comes in, including steaks and burgers, as well as ground meat. Many people order their ostrich meat online, since it’s not as widely available at supermarkets as your standard red meats. Try ostrich on the grill or seared and juicy in a hot cast iron skillet. Check out this ostrich steak recipe, with wine pairings. Ostrich is a healthy and tasty substitute for any red or white meat. Use it in your favourite recipes. It absorbs seasonings and marinates rapidly. You can buy ostrich meat online here. Since ostrich meat is so lean, you need to be careful not to overcook it. The recommended preparation or this red meat is medium or medium-rare – just like a premium steak. Ostrich is even lower in calories, cholesterol and fat than skinless chicken and turkey, while remaining high in iron and protein. The Diabetes Association approves and recommends ostrich as a leading source of protein It has also been approved by the American and British Heart Associations. 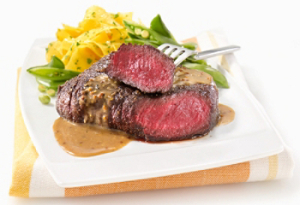 What’s more, due to ostrich’s ideal pH balance, the meat does not attract harmful bacteria like E.coli or salmonella. Tasty and healthy! The meat is very easy to prepare. Never cook ostrich more than to medium. It should be red in the center when you cut into it. Use low temperature and moisture when roasting. Ideal internal temperature when a roast is ready is 160 ° F. Ostrich meat has no bones and no shrinkage. We suggest that you brown both sides over high heat (broil, fry, BBQ) and then continue cooking over lower heat until you get it the way you like it. (Rare to Medium recommended). Most ground meats recipes advise you to drain the fat when sautéing ground meat, but ostrich ground meat is so lean there is no fat to drain. Ground Ostrich, can be used in any recipe calling for beef. Make chilli, spaghetti sauce, delicious lasagna, or use it for any casserole. Our ground ostrich meat is conveniently packaged in 1 lb. units. 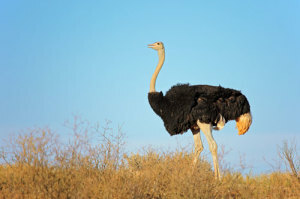 Ostrich have extremely good eyesight and can see in colour. It’s not a bird, it’s not poultry, and it’s actually in the cow, horse and camel line but with it’s very own species called Camelius Strutious, comprised of the Rhea, Cassowary, Emu and Ostrich. Ostrich cannot fly. However they are the fastest animal on 2 legs. They can sprint up to 70km/hour – and they can shake your hand because they have two fingers and two toes. But at the same time, we don’t suggest getting too close as an ostrich can kill a lion with one swift kick. Although the animal is native to Africa, ostrich thrive in Canada, with most producers located in Alberta. These animals don’t mind the winter at all and prefer to be outside the barn even in very cold temperatures. Ostrich patties provide a healthy alternative to regular hamburger patties, and many people consider them tastier and more interesting than poultry. An ostrich patty contains 22 g of protein, nearly half your daily protein allowance, in each serving. One serving of ground ostrich delivers 84 percent of your daily vitamin B-12, 51 percent of your selenium and about one-quarter of your daily niacin, vitamin B-6, phosphorus and zinc. It contains smaller but significant levels of thiamin, riboflavin, pantothenic acid, iron, potassium and copper. Now it’s easier than ever to try succulent ostrich meat at home. You can order ostrich online from Northfork Bison. We deliver it to your door. The meat is kept cool with ice packs. We can call you before we ship to make sure you are home to receive your order, or you can have your meat delivered to your daytime address (at work). We will make sure that your meat is never left unrefrigerated. Your ostrich steaks (or ground meat) will be hand cut or ground upon receipt of your order. It will then be carefully packed in an insulated box with ice packs designed to maintain your items in good condition for up to 48 hours. We use a sturdy shipping cooler and plenty of ice to assure your meat arrives in good order. We recommend shipping to wherever you are during the day. Most places of business are on a regular delivery schedule with our shippers. The shipment will have enough ice to keep frozen until you get home that evening. To conserve the ice, it is best not to open the shipment until you are ready to place the order in the freezer.